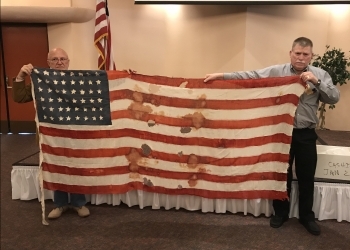 A rugged American flag was shown at the Rotary Club 190 gathering in Bartlesville. Rotary Club Member Joe Todd presented the colors midday Monday. He said the flag was first possessed by Dr. Eurich from Ponca City, Oklahoma. Dr. Eurich was a Medical Officer for the 101st Airborne in World War II. According to Todd, Dr. Eurich landed on D-Day and was eventually captured in Bastogne, Belgium. When Nazi Germany soldiers surrendered, Dr. Eurich commented on how they wished they had an American flag. Another medic told him that they did as they dyed some medical gauze red and sewed white gauze to it. Todd said they also sewed a blue patch with 48 stars to their makeshift American flag. The flag will be sent to the Oklahoma Historical Society on Wednesday.